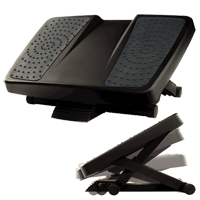 The Professional Series Ultimate Foot Support from Fellowes is a well-built adjustable non-locking foot rest which offers many desirable features. The large 13.25" deep footplate tapers from 18" wide at the top to 16" at the bottom. Textured grip plates on either side ensure stable foot positioning and can provide massage points for those who prefer to remove shoes. Three platform height settings are available (4", 5.25", and 6.5") each offering different ranges of free-floating tilt angle (-15° to +13°, -25° to +16°, -30° to +29°) respectively. Rubber grip feet will keep the footrest securely positioned on both hard and soft flooring surfaces.